Medline's Eudermic™ Ortho are 20% thicker that standard surgical gloves to provide more protection and durability. These specialty orthopedic surgery gloves have an aggressive grip with reinforced beaded cuff to resist tearing. 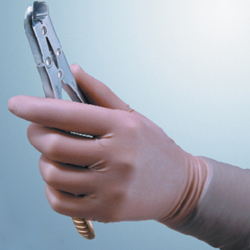 The Eudermic Ortho surgeon gloves have an inner coating polymer to assit in easier donning.